Haha! I am SO glad I’m not the only one who props up my hips and facebooks/tweets while the husband falls into peaceful slumber. LOL. Well maybe you were the only one before, but definitely not NOW. I will never be able to erase that image from my brain! I did hear that ovidrel can cause false positives on OPKs/HPTs. Maybe all those smiley faces were because of that?? Anyway, don’t worry about the insanity. You’re definitely not alone! 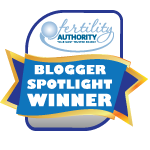 Hopefully after a few more days of temping you’ll have a clearer idea of when you ovulated. I wish you a very speedy 2ww! I have heard that too, but my main concern is that my temps were doing their own thing before I even triggered. Also, this is my first Femara cycle, so who KNOWS what that’s doing to my usually-normal temps. Hmm… just a thought… Maybe I could POAS and get a +HPT! That would be a first! …Even though it wouldn’t be real. I know, I’m a glutton for punishment, lol. Love the just keep swimming comment. Now that is all I’ll be able to think about 🙂 I’m so new at all of this I can’t really contribute but I will say I hope everything works out!! I had two cycles (IUI) that were forced to trigger early due to me surging on my own. I am assuming that the trigger in that case is just precautionary, and should have no negative effect on the outcome of your cycle. Hello! Idk if the trigger would affect the opk result, but it can give a false bfp, and I have heard that pregnant women who pee on an opk can get a positive result on those. So…it’s possible that it’s just the ovidrel causing the smiley faces. Personally I’ve gotten some ridiculous opk results back when I charted. As in 7 positive days in a row. In an unmedicated cycle. So I think it can just happen sometimes. Triggering after ovulation shouldn’t be harmful. I think I’ve heard of women who actually take one hcg shot to trigger and then do another one a few days after ovulation (i think for short luteal phase) so if you did ovulate before trigger, i would think you’d be fine. I don’t know anything about ideal follicle sizes or treatment adjustments. Sorry I can’t be of more help. Good luck though!